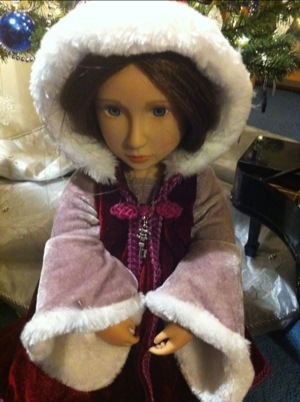 And here is her new friend Clementine (who finally arrived last week!) 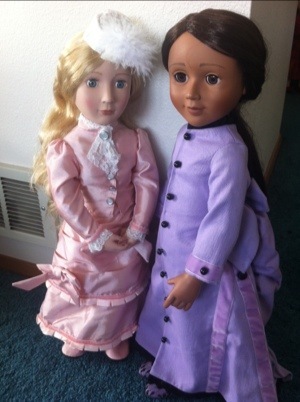 and her Victorian friend Amelia, all in their fancy costumes. Julia’s wearing the same dress she wore last week, but this week Amelia and Matilda from A Girl For All Time borrowed a couple of Julia’s dresses (Matilda’s wearing the dress Julia came in and Amelia’s wearing the Edwardian Tea Dress). 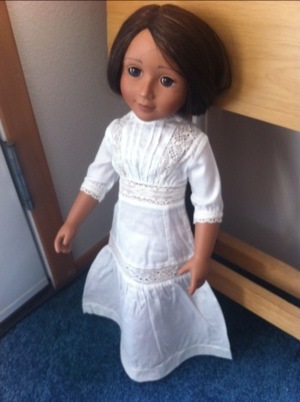 Julia is about 2 inches taller than the A Girl For All Time dolls, but only a little bit fatter, so the dresses fit pretty well. 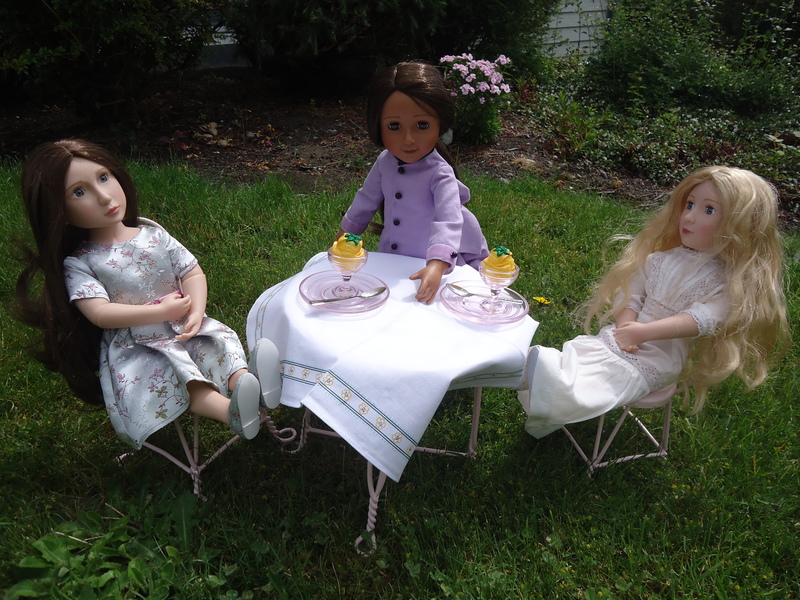 Tea Party Time! 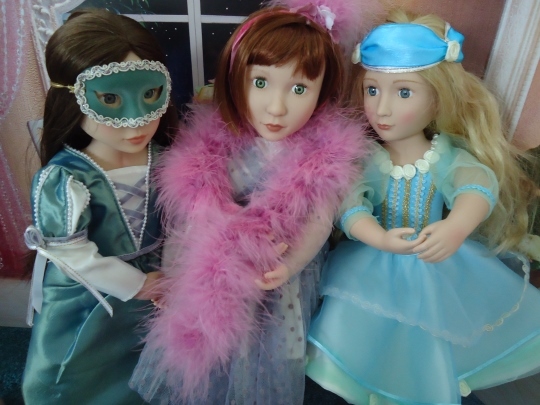 Amelia and Matilda got dressed up yesterday! 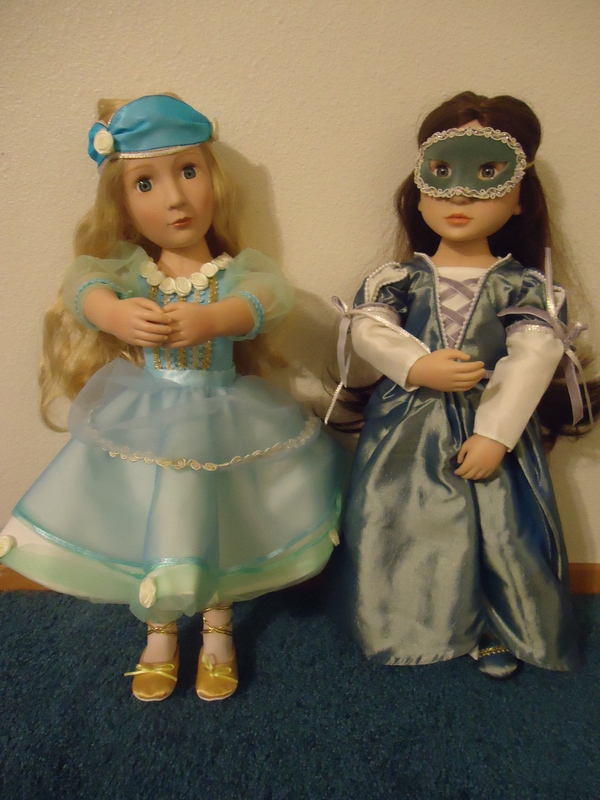 Amelia is dressed to dance on stage, and Matilda is ready for a masquerade ball. Looks like they’ll put on an interesting show! It took more than a week to get here, but Julia is finally here. 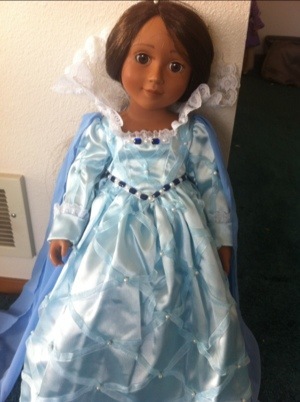 She’s a Carpatina, and her dresses are amazingly gorgeous. So much detail! It made them a little hard to put on. 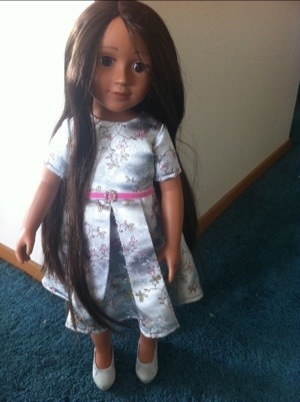 And in my opinion, her hair is too long. It keeps getting in the way, and it’s already much less smooth than it was when she arrived. But she is soooo pretty! 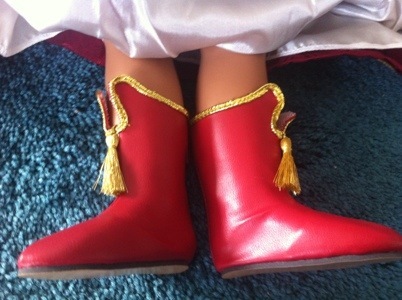 boots with the Grand Duchess dress. I love the tassels! 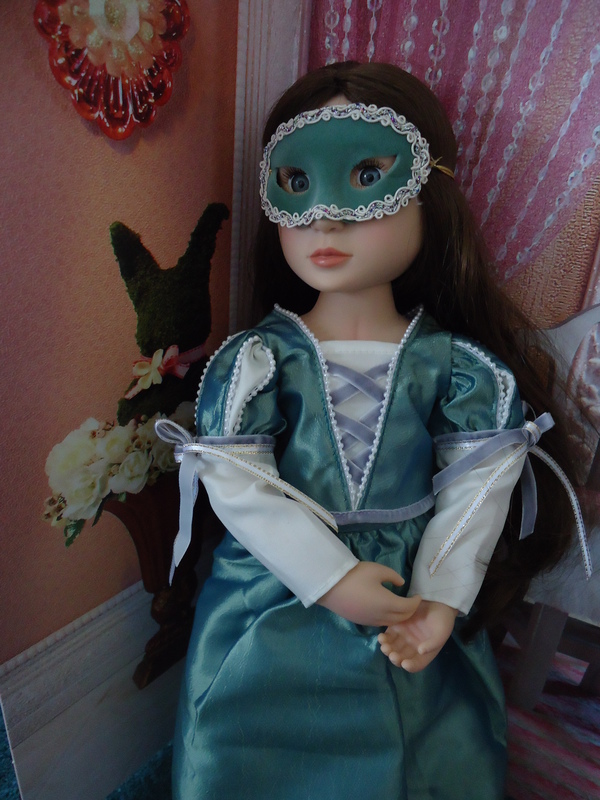 I finally got a chance to take more pictures of Amelia and Matilda. 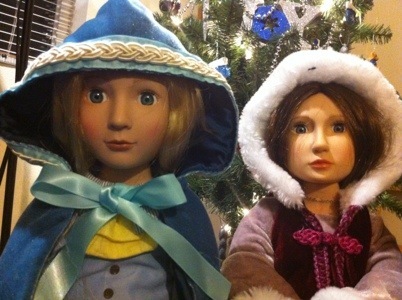 In case you don’t know, Amelia and Matilda are from A Girl For All Time. They’re a UK company, but they also have a shipping center in the US. 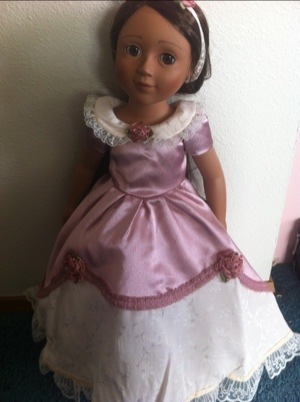 I got both dolls and all their dresses shipped for $20. 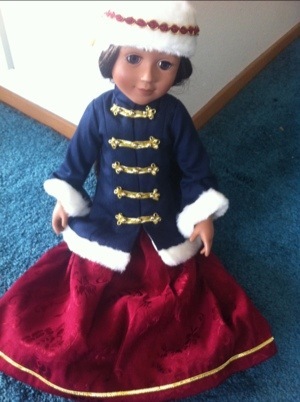 So the dolls represent different periods of British history. 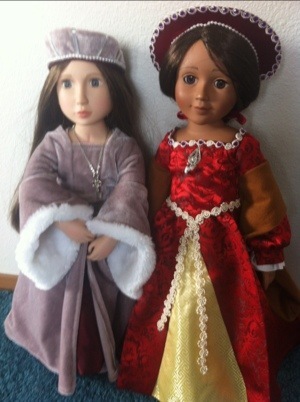 Matilda goes to the court of Henry VIII to be near her cousin Katherine Howard (Henry’s fifth wife–beheaded), and Amelia is a Victorian schoolgirl (her book isn’t available in the US yet). I really liked Matilda’s book. 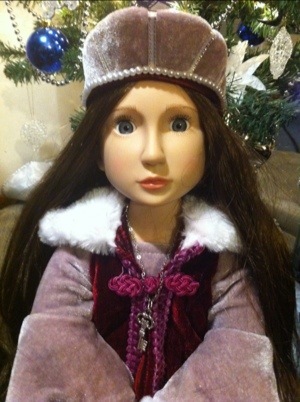 It’s a lot more mature than American girl; Matilda’s cousin is beheaded and has to sleep with the king after all. 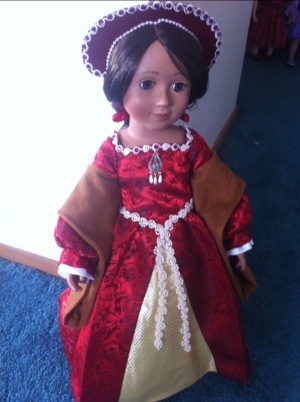 Though it does talk about the Tudors’ bathroom habits more than I’d prefer. 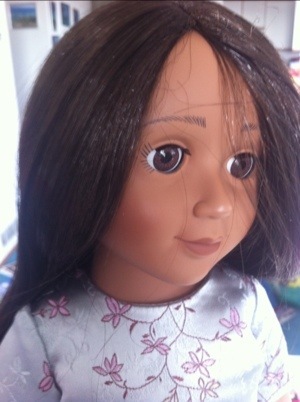 I’m beyond excited for Amelia’s book and more dolls in the line. They’re gorgeous! Their clothes are exquisite! Stay tuned for pictures of their other dresses.